How Many Tournaments Are in a Golf Grand Slam? 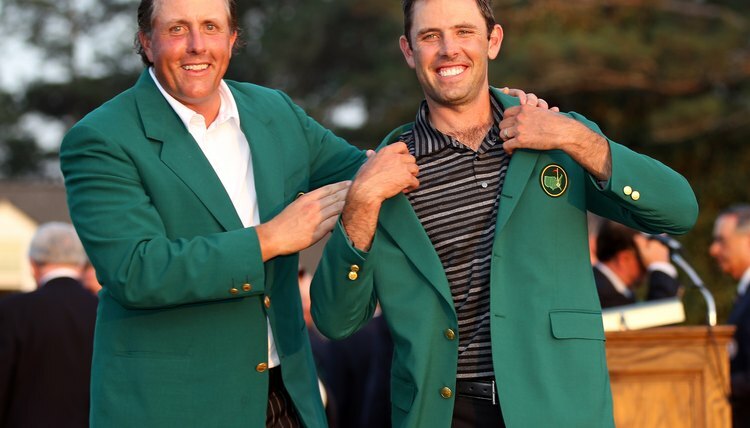 Past champion Phil Mickelson, left, presents 2011 Masters winner Charl Schwartzel with the tournament's trademark green jacket. To win professional golf's Grand Slam, a golfer must win four tournaments held between April and August. These tournaments, known as golf's majors, are the four most noteworthy events on the men's professional calendar each season. Winning a Grand Slam is one of the toughest challenges to achieve in all of sport. The four tournaments that make up a Grand Slam in golf are the Masters Tournament in April, the U.S. Open in June, The (British) Open Championship in July and the PGA Championship in August. With the exception of the Masters, which takes place at Augusta National Golf Club in Augusta, Georgia, the tournaments do not have a fixed location. The Open Championship is the lone Grand Slam event held outside the United States. For a golfer to win the Grand Slam, he must win all four of these tournaments in one golf season. Winning four events in one year is challenging in itself; winning each of the four majors would put the golfer among the game's elite. In golf's modern era, no one has ever won each of these events in one season. Golf legend Bobby Jones is credited as being the only Grand Slam winner. He won the sport's four biggest tournaments played in 1930, before the Masters was founded. Jones won the British Amateur, British Open, U.S. Open and U.S. Amateur for his Grand Slam. Because winning the Grand Slam in any given season is so difficult, golf fans often note the players who have won a career Grand Slam. This term represents golfers who have won each major tournament in their career, albeit not in the same season. Jack Nicklaus and Tiger Woods, with 18 and 14 major tournament wins, respectively, have each won three career Grand Slams. Ben Hogan, Gary Player and Gene Sarazen are the other golfers who have won career Grand Slams. The only modern-era golfer to win all four major tournaments in a row, although not in the same season, is Woods. In 2000, he won the U.S. Open, British Open and PGA Championship, and in 2001, he won the Masters. These wins meant that Woods was the defending champion of all four majors at one time. This achievement is often referred to as the Tiger Slam.